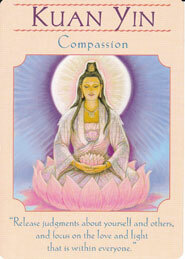 This card is inviting you to feel the presence of Kuan Yin (also known as Avalokitehvara) in your life and in your actions today. Buddhists all over the world honor her as the face of compassion and see her as a protectoress. 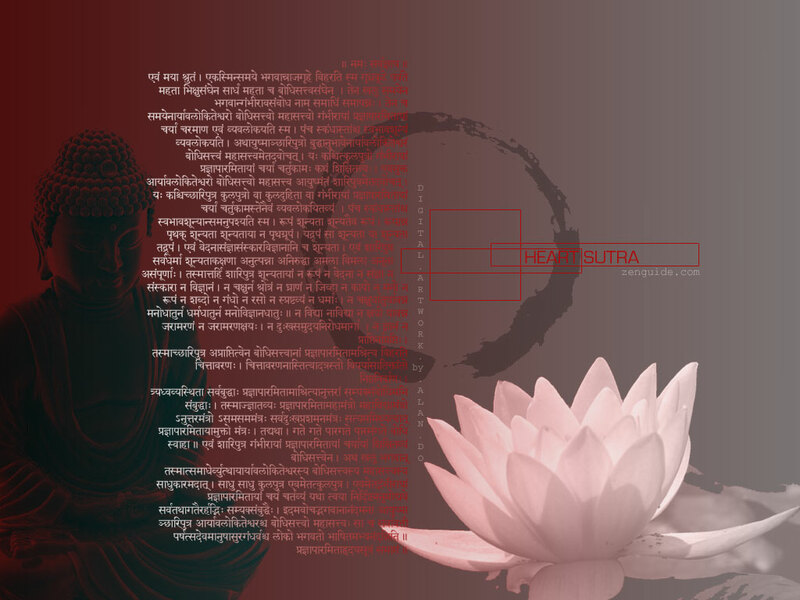 The Bodhisattva Kuan Yin is closely associated with the Heart Sutra. This Sutra is a truly beautiful and powerful prayer. A prayer chanted to release all sentient beings from suffering of any kind. Monastics and Lay Buddhists chant it daily. His Holiness The Dalai Lama will often instruct his Monks to repeat it 100 times over, sometimes more, when a catastrophic event takes place in the world. 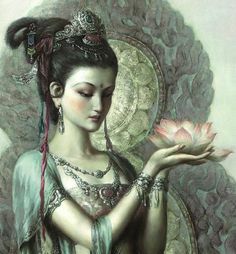 It is said Kuan Yin returned from the Pure Land to the earthly realm to relieve suffering. She is here today to remind you to be kind to yourself. It is a time to release all harsh judgments you have made about yourself and others. A time to release all feelings of guilt and shame. It is a time to focus on the love and light that is within you – your Buddha nature for we are all Bodhisattvas’. 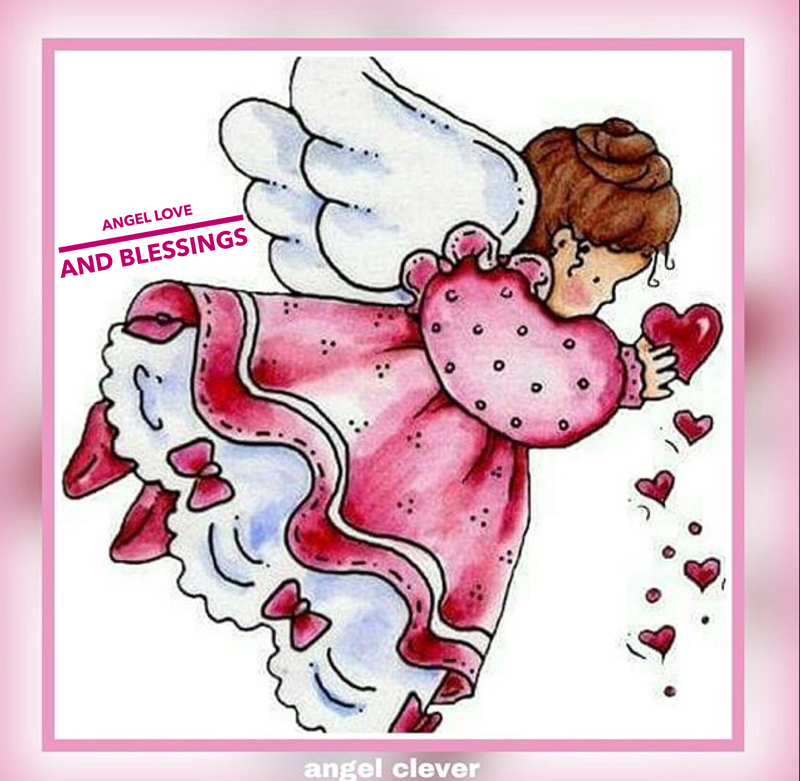 This card is from the card deck (Goddess Guidance Oracle Cards by Dr Doreen Virtue). Keep your unwavering thoughts, feelings, and actions focused on your target, and you will make your mark. Tenacity means sticking to a decision and not allowing outside forces to sway you. Imagine yourself to be like a mighty oak tree, with your roots planted deeply into Mother Earth. Feel your solid strength and steady upward growth. Know that, no matter what happens, you will succeed! Your branches may twist and turn as you flex towards the light, yet your unwavering intentions will ensure that no faint wind will sway you from your mission. Be in charge of your body, your schedule, and your mind, and keep them focused upon your target.